Fall is here for sure, because Daylight Savings Time ended in Los Angeles today. The sun is lower and the temperature is heading down. Time for some of those winter vegetables to start showing up in my recipes. Butternut Squash is one of my favorite ingredients to cook. Its earthy sweet flavor and wonderful texture allows it to be made into soups, salads, gnocchi, gratins, salsa, pizza topping, muffins, risotto, and the list goes on and on. If there is a category of food, it has probably been made with Butternut Squash. I started with a small squash that weighed 1 ½ pounds. After peeling and seeding it, there were about 14 ounces left to cut into cubes. You can make the Red Pepper Sauce a week in advance and store it in an airtight container in the fridge, which I did. This was a good thing for me because my real life kept interfering in cooking and photographing this recipe. Also I had surgery on my knee a week ago, so standing for hours had to be put on hold. My knee is good now, so I knuckled down today to finish my pasta dish. That Red Pepper Sauce has been yelling at me all week, every time I opened the refrigerator. Nag nag. 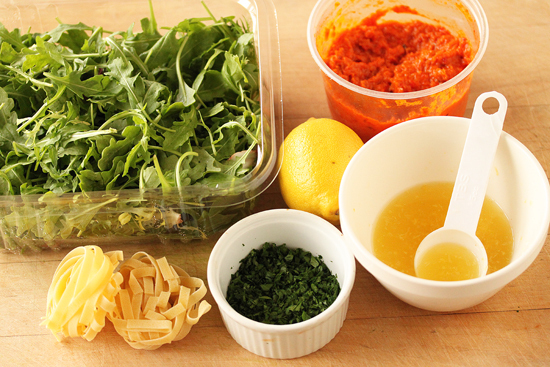 Get all of your ingredients prepped before you cook the pasta, because once its done, everything goes in the bowl at once. No time for zesting, squeezing or mincing. I made one serving for myself to photograph and eat, which is why I gave you the amounts for one serving. This is so good with the lemon juice drizzled over right before you eat it. And I have enough of the Red Pepper Sauce to freeze for future uses. Oh goodie! 1. Make the Red Pepper Sauce. It can be kept in an airtight container in the fridge for 1 week. 2. Heat 1 tablespoon of olive oil in a large skillet over medium heat. Add the squash cubes in a single layer, and cook for 10 minutes, turning often, until browned all over. Turn the heat down if they are browning too fast before being cooked all the way through. Reserve in warm pan. 3. Zest and juice the lemon and reserve. Mince the parsley and reserve. 4. Cook the pasta according to package directions and drain well. If you are making 4 servings, put all the pasta in a large bowl. Add ½ cup Red Pepper Sauce and toss to coat the pasta. 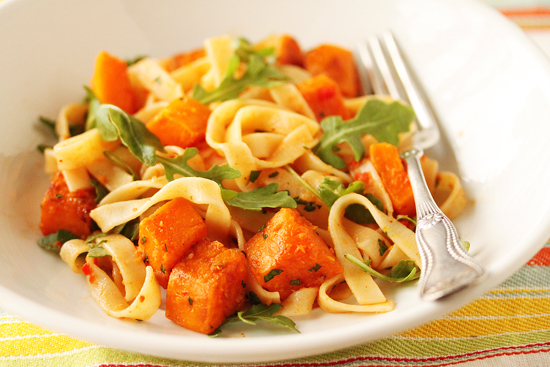 Add the butternut squash, lemon juice and zest, arugula, 1 ½ tablespoons minced parsley and toss to combine. 5. If you are plating individual servings, reserve the lemon juice and zest, and drizzle 2 tablespoons over each plate before serving. 6. Sprinkle remaining minced parsley over each plate and serve. 2. Put the red bell pepper, chiles, onion, garlic, cumin seeds and 1/4 cup oil in a roasting pan. With a spatula, mix to thoroughly coat the vegetables with the oil. 3. Cook in the preheated oven to 1 hour, turning several times. 4. Transfer roasted vegetables to a food processor while still not. Add remaining 2 tablespoons olive oil and process until smooth. Let cool and pour into container with tight fitting lid. Note: Any remaining Red Pepper Sauce can be used as a dip or added to tomato-based sauces and soups for extra flavor. Freeze in 1 tablespoon amounts on plastic wrap on sheet pan and store in a zip-close bag in freezer. This looks delicious. I love butternut squash too. I love how you paired the creamy and mellow squash with that spicy sauce. I can only imagine how delicious this must have tasted. I adore butternut squash too (both the flavor and the color!) Thanks for sharing sweet woman. This looks like such a flavorful meal! Lynne – this looks beautiful and I am sure that it tastes fantastic! Glad to hear your knee is on the mend!! 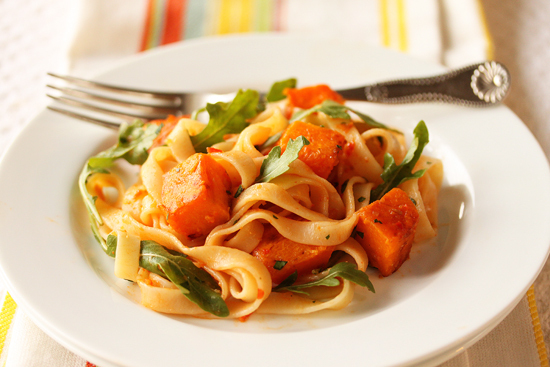 I love butternut squash as well and will definitely have to give this one a try!!! haha yes food nags at me from the fridge too…ahh the pressure! hehe. this dish looks so vibrant and tasty! Love the color in those pictures. Hope your knee is doing ok.
First time photographing pasta? Yeah, right! I made this on Sunday night. It was outrageously delicious!